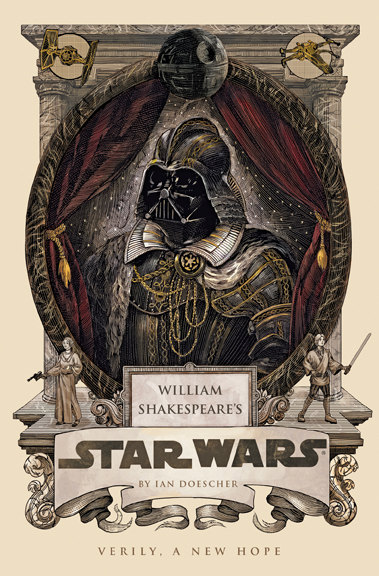 William Shakespeare’s Star Wars Verily, A New Hope. And crush a planet: ’tis the DEATH STAR blast. With these words begins a familiar tale. One of a princess, a scoundrel, an evil empire led by a dark lord, and a hero who must come into his own. In words of sufficient power and imagery to do it justice. The story of young Luke Skywalker as told by the immortal Bard, thanks to Ian Doescher. Luke has always longed for the stars, but it takes a tragedy and the guidence of friend Ben Kenobi to set him on the path to achieve a destiny he doesn’t know is his. Accompanied by two droids, Luke answers the call for help from Princess Leia. He meets the smuggler Han Solo and his first mate, the Wookie Chewbacca. They soon find themselves pitted against the mighty Galactic Empire and the Sith Lord, Darth Vader. Doescher takes the dialogue you love from the movie and turns it on its iambic pentameter head. With foreshadowing to future events, recognizable passages from Shakespeare’s better known plays, and asides from a surprising source, this book (and it’s sequels) will delight the galaxy. 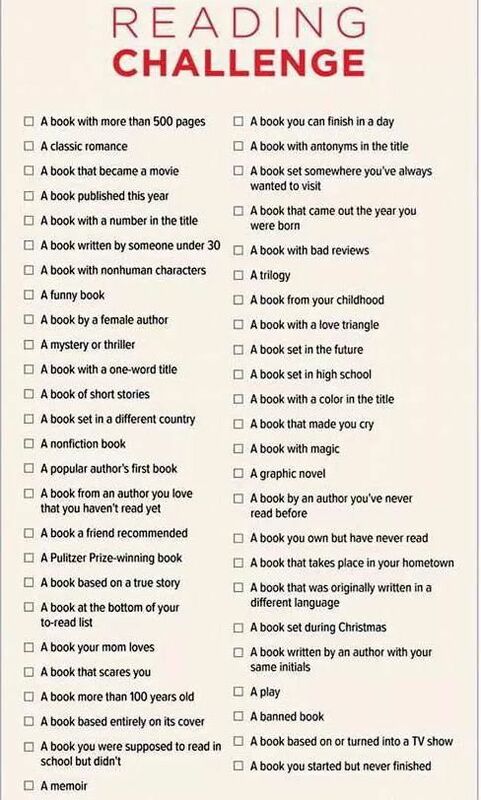 So, I came across the above checklist on Facebook towards the end of ’14. I had been slacking in my reading as of late so I decided to try and achieve it. This was helped along by the creation of a group for the challenge, also on Facebook. I also decided to try and do book reviews for each selection. I am not sure what success I will have with this, but no harm in the trying. I will put my choices in the next post and link each entry to its corresponding review as I finish it.